Nothing says Halloween tradition better than the classic animated Halloween-themed PEANUTS special, "It's the Great Pumpkin, Charlie Brown"! So many of us have found memories gathering around the Television for the annual airing! Peanuts Holiday Collection DVD with the Thanksgiving and Christmas specials , but I still prefer the tradition of watching it when it is aired on network TV. If you share my sentiment, get ready because the 1966 Charles Schultz Peanuts Halloween classic is on TONIGHT, Wednesday, October 15, 2014, from 8:30-9:00 PM (Eastern/Pacific) on ABC. I can't wait to once again join the PEANUTS gang as they celebrate Halloween while Linus hopes that he will finally be visited by The Great Pumpkin. And of course, poor Charlie Brown just can't seem to get his costume right or get any Tricks or Treats candy! Remember the classic dialogue? Lucy: I got five pieces of candy! - Kid: I got a quarter! Kid: I got a chocolate bar! - Charlie Brown: I got a rock. (Next house) Kid: I got a candy bar! - Kid: Boy, I got three cookies! Lucy: Hey, I got a package of gum! - Charlie Brown: I got a rock! That fateful bag of rocks is what drew me to the figure shown above when it was first released back in 2002. They added Charlie Brown's botched ghost costume and I was sold! Remember my previous post about my friend and co-worker's monster-themed office? 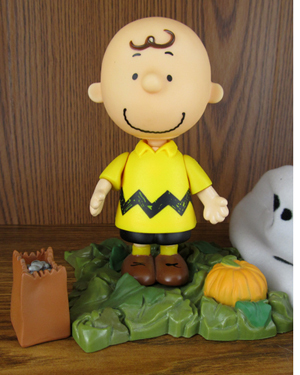 Well if you'll notice, this Great Pumpkin Charlie Brown Memory Lane Figure is included in Joe's collection (somewhat out of place with the monsters). That's because I knew he was a big Charlie Brown fan and gave him this figure about 10 years ago. 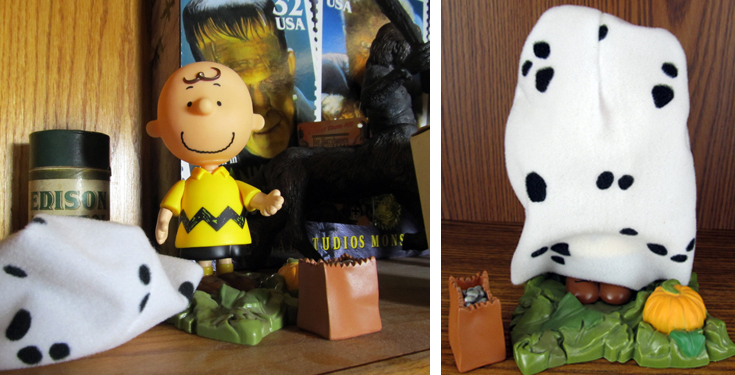 and It's The Great Pumpkin Charlie Brown 3 Pack: Lucy van Pelt, Snoopy / Woodstock & Schroeder . They of course, were also available individually like my Charlie Brown figure with his bag of rocks and the above slightly obscure Frieda with Ghost Costume, Coonskin Hat and Interlocking Pumpkin Patch Display Base . 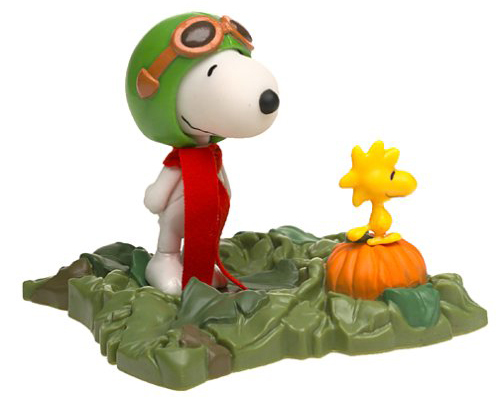 My favorite one (after Charlie Brown) is Snoopy as The Red Baron with Woodstock, It's the Great Pumpkin Charlie Brown Set. and the now hard to find It's The Great Pumpkin Charlie Brown Peppermint Patty with Goblin mask . Eventually, each Peanuts character was re-issued wearing different Halloween costumes. 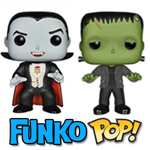 There is still a wide variety of these figures still available on Amazon. Check those out! The Charlie Brown Vampire , the Charlie Brown SuperHero , the Charlie Brown Skeleton , the Charlie Brown Pirate and I'm not sure about the one in the middle. It is Charlie Brown with a Lone Ranger type mask AND his Ghost costume & pumpkin. Many options for good old Chuck! If we stay with the idea that there were other Peanuts Halloween nights for Charlie Brown to better himself it also gets exciting for Linus! Maybe, he didn't spend every Halloween night of his childhood waiting for The Great Pumpkin. Or better yet, maybe The Great Pumpkin finally DID appear to him in the pumpkin patch! 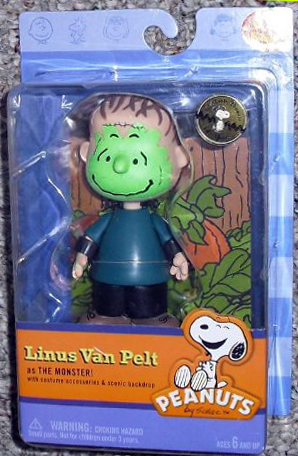 Either way, the following year Linus would finally get to dress up as his favorite Universal Monster - Frankenstein's Monster! Peanuts characters are so fun! Don't forget to celebrate Halloween with Charlie Brown, Lucy, Linus, Sally, Schroeder, Violet, Peppermint Patty, Pig-Pen, Frieda, Woodstock and Snoopy tonight at 8:30 on ABC. I'll be there!